County commissioners have voiced renewed frustration about the fact that the City of Sarasota never has turned over to Sarasota County the Ringling Boulevard site of the former Sarasota Police Department. 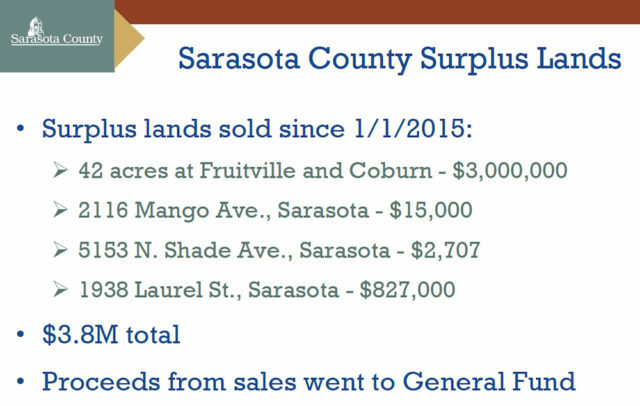 During the board’s Feb. 17 budget workshop, Commissioner Charles Hines also expressed irritation that county staff has not discussed with the commission how best to market “a prime piece of property” in downtown Sarasota that the county owns, with two attempts to sell it over the past few years having failed. Additionally, commissioners questioned why it was taking staff so long to complete a list of all potential county surplus properties that could be marketed. “I expected by this point to see multiple pages [of surplus parcels], not three or four or five … right now,” Hines told Lin Kurant, manager of the county’s Real Estate Services Department, during the workshop. 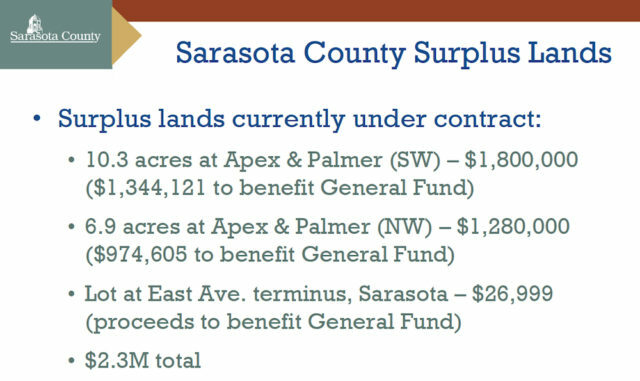 As the board determines how to pay for its top priorities, Hines pointed out, it would like to have as much money as possible from the sales of surplus lands, especially those considered of greatest value to prospective buyers. “We’ve had a large turnover in staff,” Kurant explained. It has taken about 18 months to get all the county property listings entered into a database, she added; staff finally had to hire a contract employee to assist with the work. When Commissioner Mike Moran asked her if the assessment of all surplus parcels could be completed by July 1, she told him temporary staff has come on board, so she felt the work would be completed by May. A big part of the initiative involves documenting how each piece of property was paid for, because any sale proceeds will have to be put back into the appropriate funds, she pointed out. For example, if a parcel was purchased with General Fund dollars, all the proceeds would go back into the General Fund. Because some of the property was acquired back in the 1940s and 1950s, she said, “it’s very hard” to find all the necessary documentation. Kurant told him she and her staff are working on a new Invitation to Negotiate (ITN) for that parcel. Slightly more than a year earlier — on Jan. 26, 2016 — the County Commission formally terminated staff’s most recent Invitation to Negotiate for the property. A Jan. 26, 2016 staff memo explained that staff was unable to obtain the detailed documentation it had sought on the latest proposals on the land. On July 18, 2013, the staff published an ITN on the county’s Procurement Department website and on its Real Estate Services webpage, for that land. On Oct. 23, 2013, after hearing from two respondents, the commission gave a preliminary nod to plans presented by Rod Connelly of Civix LLC, who was representing SHD Partners LLC. The proposal called for a 150-room Kimpton Hotel rising nine or 10 stories on the site, plus a 6,000-square-foot conference center and a 120-seat full-service restaurant and bar. Connelly proposed transferring to the county a separate parcel, located at 2051 Main St., which SHD Partners planned to acquire so it could replace the parking spaces that would be displaced by the hotel project. After the commission directed staff to negotiate a deal with SHD Partners, part of the agreement called for SDH partners to construct 86 parking spaces at 2501 Main St. and give that property to the county. The Jan. 26, 2016 staff memo pointed out that, ultimately, SHD Partners “failed to meet the terms and conditions” of that agreement, which was terminated on May 1, 2015. 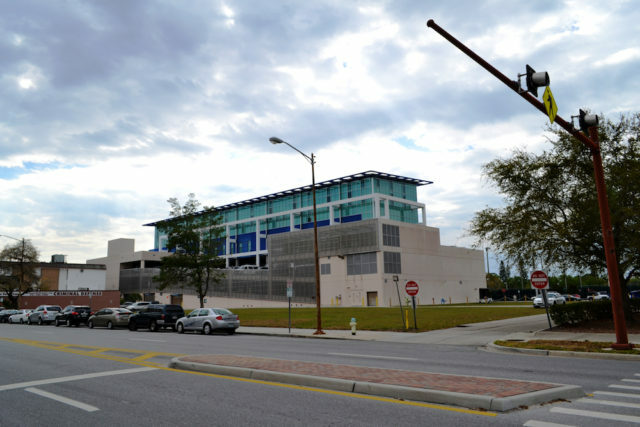 He was referring to the Ringling Boulevard site of the former Sarasota Police Department, which has been identified in county planning as the location of a future parking garage, especially for people who need to attend court or use services in the Clerk of Court’s Office, the Terrace Building or other judicial system facilities in downtown Sarasota. A 2003 Memorandum of Understanding (MOU) between the city and the county called for the city to convey the former Sarasota Police Department site to the county. Crafted by former County Administrator Jim Ley, the agreement was part of a bargain to keep county administrative offices in downtown Sarasota. 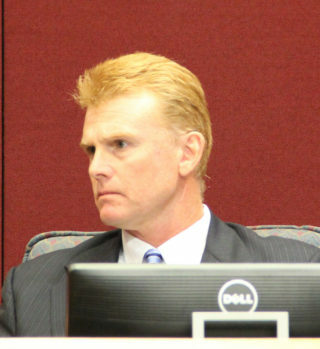 As recently as January 2014, the County Commission asked that representatives of the Office of the County Attorney meet with the city’s legal team to discuss the issue. In April 2014, County Attorney Stephen DeMarsh reported a lack of progress in those discussions. City staff wanted to undertake more research into the history of the property, including its legal description. Perhaps the County Commission should ask the City Commission to allow members of the public who need access to the Clerk of Court’s Office to park on that grass until after some other arrangements for parking can be made in conjunction with the sale of the 20 N. Washington Blvd. parcel, Hines added. 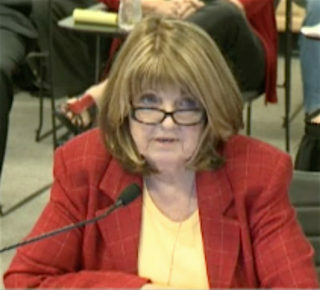 Now retired-Supervisor of Elections Kathy Dent complained to him in front of about 80 people at a public function, Hines pointed out, because people trying to cast early ballots for the 2016 Presidential Election had considerable difficulty finding parking places near the Terrace Building, where the supervisor of elections’ main office is located. 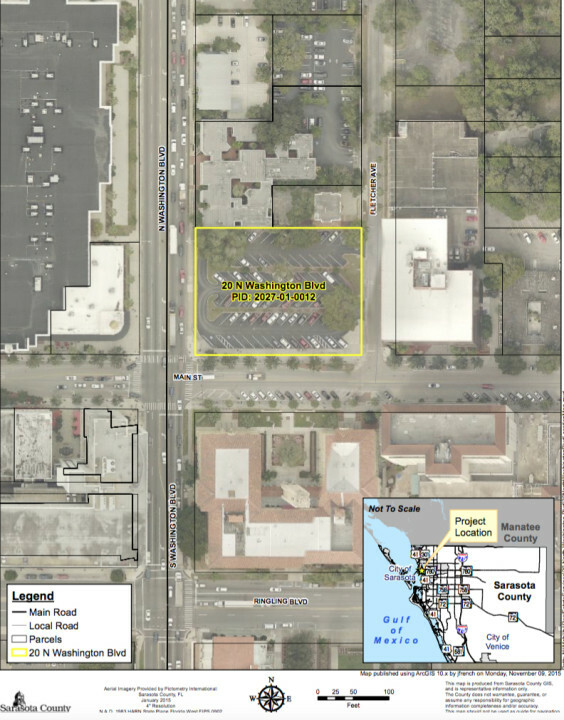 Yet, not only is the Ringling Boulevard lot empty, he added, but no development yet has taken place on the nearby parcel the county sold at 1938 Laurel St. It remains a grass lot. “We have to have some cooperation with the City of Sarasota,” he added. In his wrap-up later that day, regarding direction the board had provided throughout the workshop, County Administrator Tom Harmer said staff would talk with representatives of the City of Sarasota regarding the parking issues in downtown Sarasota. Hines also apologized to staff later that day for venting his frustrations during the surplus lands discussion.